For our first long stop of our Austria trip, I booked us in at Urlaubsnest in Moorbad Harbach (Weitra). I found it on Booking.com, after Tim and I had decided we wanted to stay within railing distance to Vienna (my pick), and within driving distance to the Waldviertelbahn and the JHMD. Originally, I started looking around Weitra, and this place popped up. We knew we wanted either a one or two bedroom apartment (remember, my mom was with us, so she needed a place to sleep to!) with a full kitchen. Urlaubsnest was reasonably priced and in a great location. 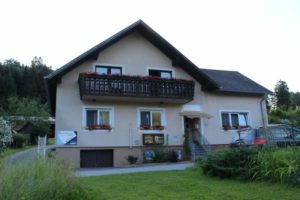 We live in a small village close to a city centre, so it made sense that we would pick an apartment located in a village closer to a larger town (GmÃ¼nd was only about 30 minutes away, Weitra even closer). The route in and out of the village is easy enough to find, but they were doing some kind of roadworks so part of the drive was spent driving on gravel roads (where we may have picked up the screw that killed our new tyre) with fields and woods on either side, it was quite picturesque (And you can see the drive on our driving video). Our landlords, Dietmar and Brigette, were fantastic. Dietmar asked me if I was on Facebook, and when I said I was he suggested that I message him through facebook so messages would get to him faster. On our drive from Neuschwanstein I kept Dietmar updated on our ETA according to our sat nav (google maps on my phone) and it was no trouble arriving later than originally planned due to traffic. We arrived around 7PM, tired and hungry, and Dietmar and Brigette offered to feed us! Brigette laid on an amazing spread and Dietmar opened up a few bottles of beer. They even gifted us with a bottle of sparkling wine waiting for us in the fridge. Our holiday was on to an amazing start! We loved everything about this facility. The kitchen had everything we needed for cooking main meals and they even had a minibar with beer and soft drinks available for purchase (no diet sodas though!). They have a wood burning stove for the winter months, and a modern electric range for the Summer months. They even provided coffee, filters, and sugar for the coffee pot (no measuring spoon though. I think I left my sliding spoon there though, much to my annoyance)! There were plenty of pots, pans, dishes, cutlery, and glasses and they provided some dish soap and a sponge. The bedroom features a really nifty lighting feature where you can change the colours depending on your mood and time of day – it even has a nighttime mode that operates on a dimmer/timer. The bedroom also features an infrared sauna, which we only used on our last 2 days, but wish we had used it sooner! Wifi was adequate and I even managed to stream Netflix one night when I was unable to sleep. When you stay at Urlaubsnest, you also have an extensive exterior grounds at your disposal. If you have children, we noticed they had a swing set, slide, sandbox, and trampoline. There is an outdoor picnic table with retractable awning and an outdoor grill/oven (which we did not use). My husband and I took a walk across the back fields and found a public walking path into a quiet wooded area and we’re sure we must have crossed the Czech border at some point since we were so close to it. We have put Urlaubsnest on our list of places to stay at again. While there is no main public transportation to Moorbad Harbach, on their website they say they will provide transportation from either the Weitra bus station or the GmÃ¼nd OBB station and I’m pretty sure we saw bus stops for a local village postbus that could get you around if you were going carless. If you do travel by car, they have plenty of off-street parking. The driveway has a slight incline to it, but once you’re up you can park anywhere at the top as long as you aren’t blocking the tractors getting in and out of the barn (and of course, don’t knock over any of the plants). Dietmar and Brigette have a dog, who does like to meet people, but she’s also shy. There are, however, several village cats that hang around. Some of which are friendlier than others and we even had one wander into our apartment to make herself comfortable on our bed! I would highly reccomend Urlaubsnest to anyone looking for an off the beaten path place to stay.